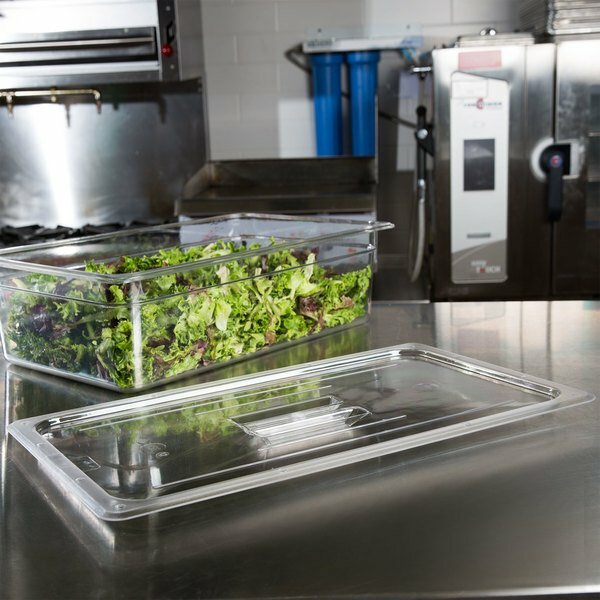 Made of crystal clear, shatter-resistant polycarbonate, this full size food pan lid with handle can withstand temperatures from -40 to 210 degrees Fahrenheit! The durable polycarbonate material also resists food acids and oils to maintain its attractive appearance. These are comparable to the more expensive name brand items, but for less! I'm constantly toting my food pans between the kitchen and farmers markets, and they stack easily on top of each other. They don't seal around the edges, but are easy to wrap with cling wrap for a tighter seal. I use these lids with the bins to freeze pastries. The bins stack well when being used or being stored. They are lightweight but sturdy and can be run through the dishwasher. 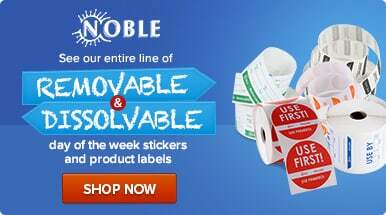 I really like these lids, they are easy to clean, and they last forever! They fit all of our full sized pans. I couldn’t be happier! Great product and sturdy. Fits all the pans that we have and we have a mix of brands so that is a huge plus! Nothing worse than having mis-matches and nothing fits. Cleans easy and doesn't warp in the dish machine like some brands do. I will keep buying these as i need them. This lid works great and fits well. 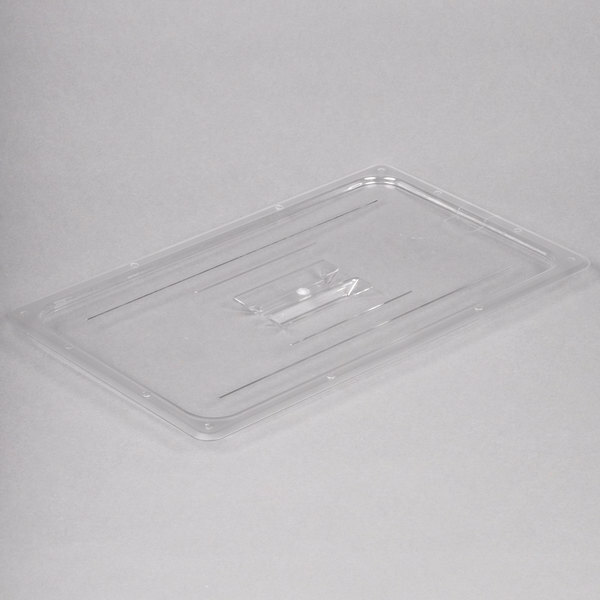 We use the container that this lid fits to store fish and this lid is easy to remove and replace as needed. Fits well. Nice addition to our clear tubs. We’ll be using these often for serving, as they showcase colorful dishes. Will be looking at other sizes to compliment soon. Typical lid for a food pan. The handle is great when dealing with a hot item since you don't risk a steam burn opening the pan. These are great for covering a full hotel pan that is finished cooling in the walk-in. I will be poaching fresh peaches on these at my cinnamon roll shop here in Las Vegas. As soon as they cool off enough I cover the pan with this lid and consolidate them into green cambros the next day. We use this for large salad prep for our family gatherings. It fits securely and is still very attractive and not all scratched up like some clear containers and lids get. Fits in my fridge very well. Good cover that seems to be universal for older tubs. The ridges on bottom seem to set into most pans and keep them covered without any slippage. Inset handle is an added feature. These lids fit perfectly with their containers. the plastic is nice and durable and should last a while. I am very happy with the product. 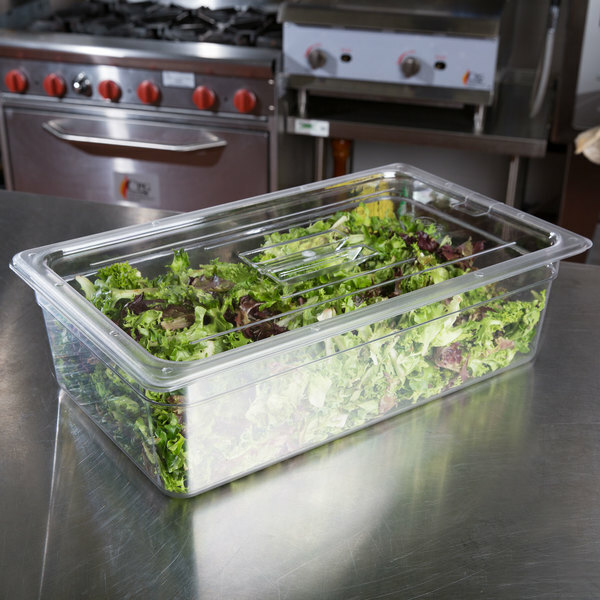 The Full Size Clear Polycarbonate Food Pan Lid with Handle is very durable. It is easy to clean and the price is great. You couldn't ask for more. Webstaurant food pans seem to hold up well when compared to CAMBRO... So kudos there. This is an item you can save money on while trusting the durability will be similar to top brands. The polycarbonate pan lids are good quality and will hold up well for my intended purpose. I serve a few different cold items at catered events and these work well. These lids are great if you buy the correct size pan for it. 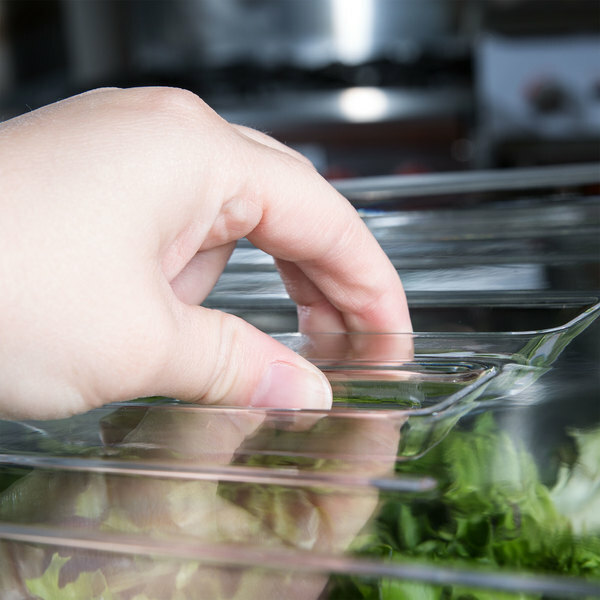 You can easily store veggies or meats, pretty much any food items, to keep them fresh and cold in the salad bar. Love these containers. They fit nicely into my refrigerator and stack great when they are full. I also appreciate how neatly they stack when they aren't in use - my space is limited so that's important to me. Nice, sturdy lid to go with the same-size food pan. It cleans up nicely, and fits the pan perfectly. We keep ice in ours and store it in the freezer.